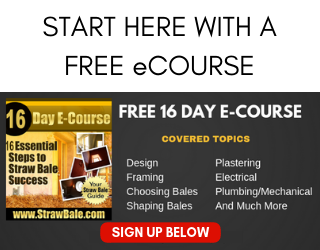 Here’s some feedback we have had from people who have used our straw bale building and construction DVDs and from people who have signed up for our free e-course: “7 Essential Steps to Straw Bale Success”. 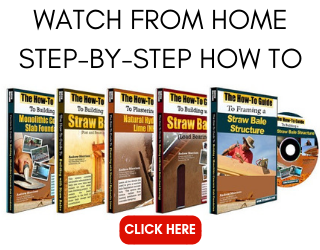 “Andrew Morrison’s great instructional DVD covers all aspects of building a post and beam type Straw Bale building. I must say that on a ‘return on investment’ basis this DVD beats any SB book several times over, hands down! When you take into consideration the cost of SB books and then add the extensive time needed to read them, try to make sense of the diagrams and descriptions, its easy to see how a small investment on this DVD is a great dealeither as a starting point to learn about SB building or as an extension to your existing reading. Even if you have some practical experience its unlikely that Andrew’s DVD isn’t going to pay for itself several times over. Great service! Yes … these are excellent videos … by far the best I have seen. I like the fact that you guys cover EVERY detail. Many videos give you the big picture but then leave you hanging on the small stuff which limits your ability to actually do the project. “Our goal is to put a roof over our heads without a mortgage. We are not builders – this idea is huge for us. We are building very small, an arrangement that suits us well. Thanks again for being such a solid inspiration, your message is true, brave and strong – and practical. “I visit strawbale.com web site two or three times a week , taking in as much information as I can making notes, my go to page for information, one of my top 3 favorite places to be on the web. Thank you for seeing my bigger picture and your advice, hopefully I will someday soon send you pictures of my SB home. 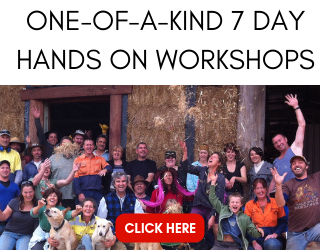 “I have attended workshops on Straw Bale construction and bought several books on all aspects of straw bale construction and finishing, and have found these DVDS to be the absolute best, most informative, and easiest to understand if you want to build using straw bale. I look forward to new additions to this resource library to assist those of us that love the straw bale concept. “Andrew, I purchased your Post & Beam Infill, Plastering with NHL and Monolithic Concrete Slab DVD’s and want to offer you my heart felt thanks. They walked me through step by step and answered all my questions, they gave me a direction, a road map if you will, to allow me to build my own dream which will start if all goes well in Aug, 2007. — Kate and Michael B.